Foreword by Karl Dawson. How we come into the world really matters. Yet within our current Western birthing paradigm, we have lost touch with the impact that the experience of birth can have on the baby. What happens to us in the womb and at birth can have far-reaching consequences that shape the way we experience and see the world for the rest of our lives. This groundbreaking book dispels the myth that babies are not conscious beings. It also shows how many of our beliefs are formed in the womb and at birth: beliefs that end up running our lives today. 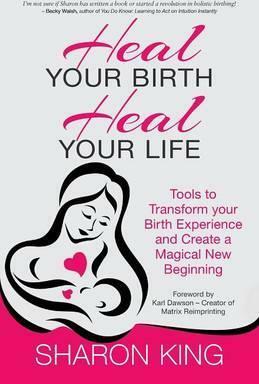 As well as highlighting the effects of birth trauma, 'Heal Your Birth, Heal Your Life' offers practical solutions. You will learn how to transform and rewrite traumas that happened both at birth and in the womb, so that you can: understand the impact that your birth is still having on you now; learn how to go back to the womb and birth when beliefs were formed and rewrite them; discover how to release birth trauma; learn new tools to rewrite your birth, impacting healing on all levels. Containing a whole host of research from some of the leaders in the field, this book offers a solution-based approach to overcoming birth trauma.It is for anyone who has ever experienced a birth trauma, or had a parent who experienced stress when they were in the womb. It is for mothers who are about to give birth and want to ensure that they do not carry their own birth traumas into the birthing experience. It is also for practitioners of all modalities, who want to help their clients connect with, and transform, the subconscious memories of their birth. Sharon King is the creator of Matrix Birth Reimprinting, an evolutionary protocol that enables us to rewrite our birth experience. Many experts worldwide are unified in the understanding that how we come into the world affects our emotional and physical health on a multitude of levels. Sharon shares that, by rewriting our births with this powerful tool, we are able to impact our wellbeing in many significant ways.Sharon has worked with thousands of people all over the world to rewrite their birth stories, often with a remarkable impact on their lives in the present. She has taught practitioners how to help others transform their experience of being in utero and birth too.She also works with pregnant women, to help them to have an empowered, natural birth, and with parents whose children experienced a birth trauma.